Many have noted that the out-of-bounds area of the green-on-green tennis courts at the Rio Olympics look a bit like a green screen. But only one person had the wherewithal to take the time to actually use that space as a green screen and insert some ridiculous effects around the edge of the court. Imgur user factionman aka Graham Hughes put together a few nice revamps of an Andy Murray tennis match, relocating it to the smokey interior of a volcano as though the players were just pawns in Dr. Evil's nefarious Olympics. The match was also relocated to space, the ocean, and the opening credits of Star Wars. It's really quite brilliant, and if you don't see that there's no helping you. In fact, there should be more of these. Tennis in The Upside Down. Tennis in the digestive tract. Tennis in the murky green water of Olympic swimming pools. Take a look at the green-screened courts below. 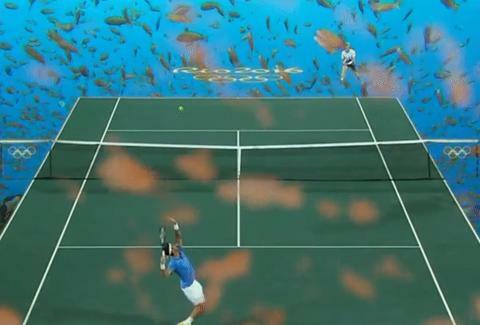 The Olympic tennis final being played on a giant green screen. Dustin Nelson is a News Writer with Thrillist. He was prom king of The Upside Down. Follow him @dlukenelson.